I accidentally tripped upon the AlumaliteUSA website while browsing Google Images for an interesting and different muzzle device to put on the Precision AR-15 Rifle we raffled off in 2010. After thoroughly reviewing the website, I contacted them to see if they would like to get involved in the project. A couple hours later Michael Yoder and I were exchanging emails discussing the look of the rifle build and what kind of muzzle break they could make for us. 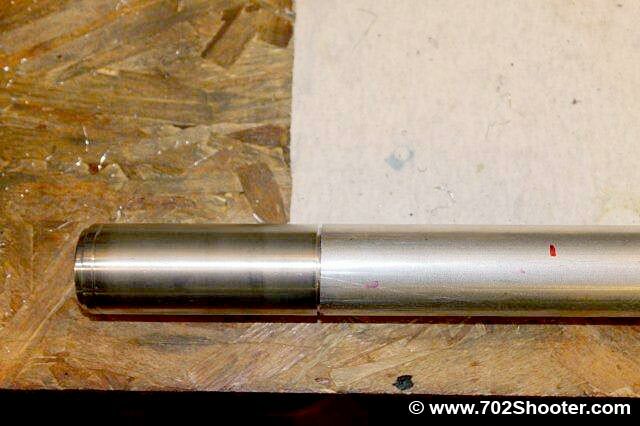 After further discussion we decided on protecting the barrel better by adding a shroud to the brake and then Mr. Yoder got to work manufacturing a new AlumaliteUSA Muzzle Brake Barrel Shroud. While displaying our rifle, many people were initially attracted to it because of the look of the AlumaliteUSA Muzzle Brake Barrel Shroud Review. Since the Lilja barrel we used was already threaded at 1/2 – 28 TPI, the device was threaded the same so it simply screws on to the end of the barrel. A large number of people asked if it was a sound suppressor, which it is not but in some aspects, it does resemble one. The product is built well and had a nice shiny finish but we ended up bead blasting part of it to match the overall look of rest of the rifle. Mr. Yoder was kind enough to take some photos as they put it together. In the following photo gallery, you can see the process pretty much from start to finish. Check out the pics as AlumalightUSA transforms the raw materials into the final product. The barrel extends 4″ into the shroud. The barrel shroud portion covers 4″ of the Lilja AR740 barrel leaving only about .5 to .75″ of the barrel exposed, after the J.P. Adjustable Gas Block. As for the functionality of the muzzle brake itself, there has been a bit of debate. Several of the local precision shooters were turned off by an aluminum brake. They question if it can be as effective as the Alumalite site suggests. The term C.D.I. (chicks dig it) was referenced often. Even though we have run some rounds through it, during our barrel break in and test of the U.S. Optics scope, we do not have enough data to give an honest opinion on how the muzzle brake stacks up. Perhaps the raffle winner, Terry Farr, will be willing to share his insight as he get more time behind the trigger. If you take a stroll through the company’s website, you will see that they have a ton of examples of their custom work as well as some ready made products that you can purchase right away. They’ve got products for hunting rifles, black rifles, and even Saiga shotguns. If you’re looking for a unique way to finish off a certain gun, you may want to contact AlumaliteUSA to see what they can build for you. Alumalite products look cool. I tried to do business with Mr Yoder. He took my money without issue, will not respond to emails an 11 weeks later still no product. Stay Away from this business! Ordered two muzzle devices from AlumaliteUSA on 9 Aug 2017. payment was drawn from my bank account on 11 Aug 2017. I have tried to contact them to no avail. It is now 10 Oct, and have still received my product or heard any thing from them. In my experience I would classify this outfit/person a fraudulent scam.